This one is located to the left of the hometown portals.. in the same docks as The Big Race, but on the other side. Contrary to what the goblin claims, your time really doesn't matter. As long as you finish within 99 tolls, you'll get credit for finishing the quest. This is helpful, because it's pretty tough to learn the course your first time! How about a freaking map somewhere showing the course ? This has to be the first time Wowhead is really letting me down on useful information about completing a quest. Landing in the middle of the Great Sea because of a rocket or spring will ruin your fun. It'd really be nice to have a reset button, until then have fun swimming back if you screw up. Through my way of figuring out the course and to help others, here's a list of Waypoints used by TomTom. just copy/paste into a macro and use just before mounting a racing mount. Purple: is on top of the mountain to the east. To get to it, look at the map on the right hand side of the island, north of the marked cave entrance is a 'ramp' into the side of the mountain. Use this to get up there. Red: on top of the mountain to the north. There is a ramp in the maintain to can use to get up. Finish: at the docks. Basically use the same rute as when you normally arrive at the island. TomTom Waypoints do not work well, as they tend to switch to the nearest point! If you port away, such as to Coren Direbrew, you'll be dismounted and the course boosters will despawn. If you pick up a mount and attempt to rerun the course, you'll have to do so without any boosters.. Drop the quest and restart to save yourself some time! 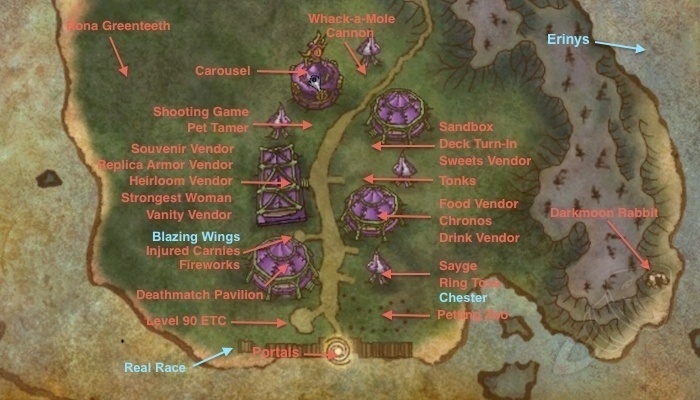 If you think the race is bugged, and you can't interact with the items on the way, check your darkmoon tokens, you are probably ran out of them. Passe pela Faixa de Largada, encoste no Marcador Roxo, no Marcador Verde, no Marcador Vermelho e volte para a Faixa de Largada. Esta é a grande corrida! Boa sorte! Esta corrida tem quatro fases: passe pelo poste roxo, depois pelo verde, pelo vermelho e volte para cá. O tempo conta, então é bom correr!